Deuterium is an isotope of hydrogen with an added neutron. The ratio of deuterium to hydrogen in water is a key diagnostic to determining where in the Solar System an object originated and in what proportion asteroids and/or comets contributed to Earth's oceans. 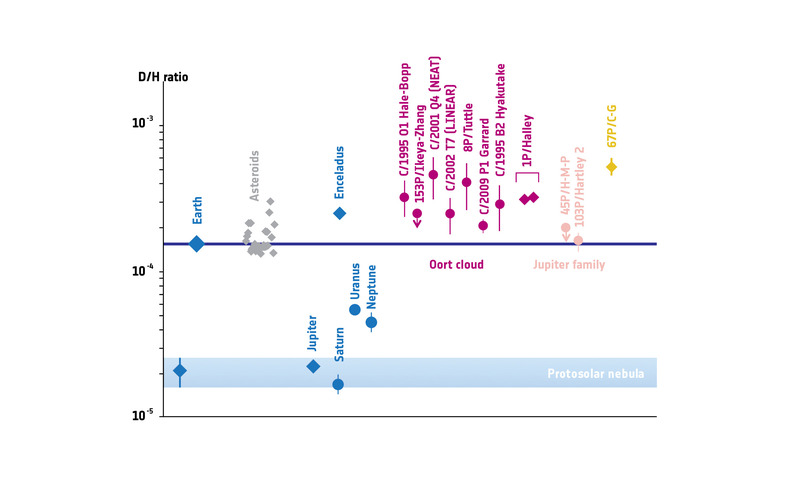 The data points are grouped by colour as planets and moons (blue), chondritic meteorites from the Asteroid Belt (grey), comets originating from the Oort cloud (purple) and Jupiter family comets (pink). Rosetta's Jupiter-family comet is highlighted in yellow. Diamonds represent data obtained in situ; circles represent data obtained by astronomical methods. The lower part of the graph shows the value D/H measured in molecular hydrogen in the atmosphere of the giant planets of the Solar System (Jupiter, Saturn, Uranus, Neptune) and an estimate of the typical value in molecular hydrogen for the protosolar nebula, from which all objects in our Solar System formed. The horizontal blue line shows the value of the ratio in Earth's oceans, which has been determined to be 1.56 × 10-4. Rosetta's ROSINA instrument measured the water vapour emanating from Comet 67P/Churyumov-Gerasimenko and found it to be 5.3 × 10-4, more than three times greater than for Earth's oceans. The discovery fuels the debate on the origin of Earth's oceans and whether asteroids or comets played the bigger role in delivering water.